This article presents the main results from quarterly statistics on maritime transport of goods in the European Union (EU), plus figures for Iceland, Norway and Turkey. It covers the gross weight of goods handled in the main European ports, by type of cargo, direction, reporting country and various partner maritime geographical areas. These data are complemented by maritime transport flows with the main extra-EU partners, and with individual results for the major European ports. The article contains data for the 3rd quarter of 2014 and a first estimate for the 4th quarter of 2014.Please note that the quarterly port activity figures are provisional and subject to revisions. 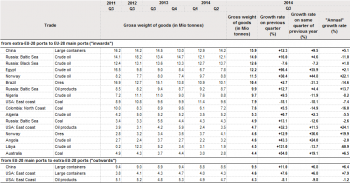 At 916 million tonnes, the gross weight of goods handled in the main EU-28 were little changed both in the 3rd quarter of 2014 compared with the previous quarter (as presented in table 1 and figure 1) and with the 3rd quarter of 2013. The recent port figures seem to indicate modest growth in European port activity at the end of 2013 and start of 2014. Comparing the four quarters ending in the 3rd quarter of 2014 with the previous four quarters shows a growth of 0.5 % in the total tonnages handled in the main EU ports. The first estimate for the 4th quarter of 2014 (as presented in Figure 2) strengthens this impression. The gross weight of goods handled in the main EU-28 ports is estimated at 932 million tonnes in the 4th quarter of 2014. This is an increase of 1.7 % from the 3rd quarter of 2014 and the annual growth rate for 2014 is estimated at 0.6 %. Nevertheless, the gross weight of goods handled in the main EU-28 ports in the 3rd and 4th quarters of 2014 was still lower than the volumes handled in the 3rd and 4th quarters of 2007, before the start of the economic downturn in Europe. Inwards movements of goods increased by 0.7 % in the 3rd quarter of 2014 compared with the previous quarter, and make up about 60 % of the total volume of goods handled in the main EU-28 ports. In comparison, outwards movements of goods decreased by 1 % in the same period (Table 2). Compared with the 3rd quarter of 2013, the tonnages of most types of cargo handled in the main EU ports increased in the 3rd quarter of 2014. The tonnages handled for dry bulk grew by 1.5 %, for containerised goods by 3.4 %, for Ro-Ro mobile units by 3.3 % and for other general cargo by 10.4 %. In contrast, the tonnages of liquid bulk goods handled in the main EU ports in the 3rd quarter of 2014 fell by 2.6 % compared with the corresponding quarter of 2013 (Table 3). The Netherlands, the United Kingdom (UK), Spain and Italy were the largest maritime freight transport countries in Europe in the 3rd quarter of 2014, all handling more than 100 million tonnes of goods in their main ports. 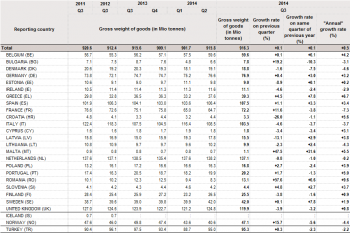 In the 3rd quarter of 2014, Italy has recorded decrease of 3.7 % in the handled tonnes of goods compared to the 3rd quarter of 2013 (Table 4) and has been overtaken by Spain. Twelve of the maritime EU member states reported growth in the total tonnages of goods handled in their main ports in the 3rd quarter of 2014 compared to the previous quarter, while eleven of the member states reporting decreases in port activity. The largest decreases were recorded in Croatia, Latvia and Estonia, all reporting reductions in port activity of more than 8 % compared with the previous quarter. In contrast, increases of more than 45 % in the overall port activity were reported by Malta and Romania in the same period (Table 4). Deep sea shipping tonnages to and from the main EU-28 ports rose by 7.4 % in the 3rd quarter of 2014 compared with the previous quarter, with short sea shipping tonnages increasing by 2.8 %.In the same period, international extra-EU transport by sea increased by 5.2 %, due to increases in seaborne transport to and from Asia & Oceania, with smaller contributions from Africa and America. It should however be noted that these figures are influenced by the erratic movements in transport to and from unknown geographical zones in the provisional data for the three quarters of 2014 (Table 5). Comparing the 3rd quarter of 2014 with the previous quarter, there were substantial increases in inwards movements of crude oil from Libya, Egypt, Angola and Norway, coal from Australia and oil products from the East coast of the USA. In contrast, the same period saw marked falls in inwards movements of coal from the East Coast of the USA and crude oil from the Black Sea area in Russia (Table 7). Russia is the EU’s largest maritime transport partner in terms of total gross weight of goods, followed by the USA, Norway, Brazil, China and Turkey (Table 6). A substantial share of this Russian seaborne transport is made up of export of liquid bulk goods to EU ports, especially crude oil and oil products from the Black Sea and the Baltic Sea (Table 7). Three of the top 5 ports in Europe recorded increases in port activity in the 3rd quarter of 2014 compared with the previous quarter. Europe’s largest port, Rotterdam in the Netherlands, saw an increase of 1.7 % in the total tonnages handled (to 103.1 million tonnes). There was an increase of 0.6 % in port activity for Antwerpen in Belgium, as well as 5.9 % rise in the French port of Marseille. In contrast, the port of Amsterdam in the Netherlands recorded a substantial decrease of 13.4 % in the same period, while the port of Hamburg in Germany registered a fall of 0.7 % in the total tonnage handled (Table 8). In the 3rd quarter of 2014, Rotterdam was the largest European port for handling all types of cargo except Ro-Ro units. Compared with the previous quarter, Rotterdam recorded increases in the tonnages of containerised goods (+4.5%), liquid bulk goods (+3.7%) and other general cargo (+7.6%) but recorded a fall of 7.9% in dry bulk goods handled (Tables 9-13). In the same period the port of Amsterdam recorded a decrease of 6.9% in the tonnages of dry bulk goods, while ports of Iskenderun Hatay and Hamburg reported increases in dry bulk goods of 11.5% and 1.1% respectively. The port of Constanta in Romania recorded a very substantial increase in the tonnages of dry bulk goods handled in the 3rd quarter of 2014 that nearly tripled the tonnages of this cargo compared with the previous quarter and consequently entered the top 5 list of the dry bulk ports (Table 10). The port of Marseille recorded a substantial increase of 11.3% in liquid bulk goods handled, while Algeciras reported a fall of 9.7% in the tonnages of containerised goods in 3rd quarter of 2014 compared to previous quarter (Tables 9 and 11). Dover in the UK remained the largest European Ro-Ro port, handling a total of 7.2 million tonnes of goods loaded on Ro-Ro mobile units in the 3rd quarter of 2014. On the other side of the Channel, the French port of Calais reported a substantial decrease of 16.9% in tonnes of goods on Ro-Ro units in the 3rd quarter of 2014 compared to previous quarter (Table 12). The content of this statistical article is based on data collected within the framework of the EU maritime transport statistics Directive 2009/42/EC on statistical returns in respect of carriage of goods and passengers by sea. EU-28 aggregates refer to the total of 23 maritime Member States. The Czech Republic, Luxembourg, Hungary, Austria and Slovakia have no maritime ports. Norway and Iceland provide Eurostat with data as members of the European Economic Area (EEA). However, for Iceland data are currently not available. The EEA country Liechtenstein has no maritime ports. Turkey provides data on a voluntary basis as a candidate country. “Main ports” are ports handling more than 1 million tonnes of goods annually (however, data for some smaller ports may be included in the published results). Data are presented at level of “statistical ports”. A statistical port consists of one or more ports, normally controlled by a single port authority, able to record ship and cargo movements. All tables are based on ports total (inward + outward) declarations. The results represent the "handling" of goods in ports. “Short sea shipping” aggregate (in Table 5) includes the partner ports situated in geographical Europe, on the Mediterranean and Black Seas. “Deep sea shipping” is the complementary geographical aggregate. A more extensive definition of “short sea shipping” is available in the article Maritime transport statistics - short sea shipping of goods. Direction: “inward” transport is distinguished from “outward” transport. Partner geographical area: usually this corresponds to one country, with the exception of countries of such a size and/or geographical position that the location of individual ports may be quite different and may have a strong impact on the maritime route followed. For example, the ports of the USA are grouped in two geographical areas: "East coast" (including Atlantic, Gulf of Mexico, Great Lakes and Puerto Rico) and "West coast" (Pacific). Type of cargo: the following thirteen cargo types are used in Table 8: liquefied gas, crude oil, oil products, other liquid bulk goods, ores, coal, agricultural products, other dry bulk goods, large containers, Ro-Ro mobile units, forestry products, iron/steel products and other general cargo. The first four types constitute "liquid bulk", the subsequent four types "dry bulk", and the last three types "other general cargo not elsewhere specified", as presented in Tables 3 and 9 to 13. Quarterly data are in general provisional. Revisions may be made by countries as more complete information becomes available or as a result of quality checks. More specifically, when the complete set of annual data emerges, this usually involves some revision to quarterly data for some countries. This applies particularly to the quarterly estimates of port traffic by type of cargo, which are less robust than the annual totals. 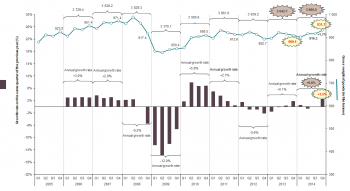 Annual data as presented in this publication are the “rolling” four quarter totals, ending in the latest quarter and the corresponding four quarters for earlier years. As a result, the four quarters included do not necessarily come from the same calendar year. For example, the "Annual" growth rate in Figure 1 shows the percentage change for the four quarters ending Q3 2014 compared to the four quarters ending Q3 2013. The basic results (in million tonnes; in thousand TEUs) and the derived indicators (growth rates) shown in the tables are rounded. However they are all based on the non-rounded original data, as available in Eurostat's database. A first estimate for the following quarter is included in Figure 2 in this publication. The first estimate is based on data provided by the reporting countries in the same way as the ordinary maritime transport statistics. However, the quality checks on the underlying data have yet to be completed for all countries. Thus, the estimated figures may be subject to a higher level of revision than the statistics for the other quarters in this publication. The quarterly data for port activity in France have been partially estimated by Eurostat for the period 2009Q1-2014Q1 and 2014Q3. They are to be considered as provisional and are likely to be revised. In general, these estimates reduce the accuracy of the statistics on detailed levels. Starting from 2014 Q1, transport to the offshore Adriatic LNG terminal is reported under the code for Italian offshore installations (IT88P). From 2009 Q3 - 2013 Q4, this transport was included in the figures for Porto Levante (ITPFO). The quarterly figures for the port of Amsterdam include data for the ports of Velsen and Ijmuiden. Starting from 2013 Q1, the quarterly figures for Germany include data for all national ports (both main ports and minor ports). Starting from 2013 Q1, the quarterly figures for Sweden include data for all national ports (both main ports and minor ports). Starting from 2011 Q1, the quarterly figures for Spain include data for a number of regional ports outside the state-controlled port system. Due to revisions of the underlying data, figures in this article may differ from figures currently or previously available on Eurostat's web site. The content of this statistical article is based on data collected within the framework of the EU maritime transport statistics Directive 2009/42/EC of 6 May 2009 on statistical returns in respect of carriage of goods and passengers by sea), which is a recast of the original Council Directive 95/64/EC of 8 December 1995.